Use Ignite UI CLI: Learn more about Ignite UI CLI here. Use npm to add Ignite UI in existing project: Learn in detail here. Use Ignite UI for Angular toolbox extension in Visual Studio Code. In this post, we will follow steps by steps approach to work with Ignite UI for Angular toolbox extension. You can learn more about extension here. 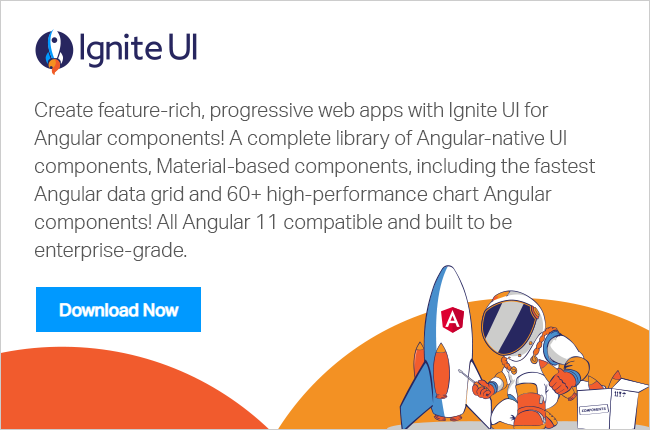 It allows you to add Ignite UI for Angular components easily to the template. Let us start with browsing for the extension. To browse extensions, click on the Extensions in activity either bar or click shortcut key Ctrl+ Shift+ x. Feel free to install both extensions to speed up the Angular development process with Ignite UI for Angular components. To install, just click on the Install button. Import required modules for the added component to the application module or next available module. In this way, you can work with Ignite UI for Angular Toolbox. Please give a try and let us know your feedback.